It uses an advanced filesystem, ZFS, under the hood. ZFS features data integrity (RAID equivalents), compression, deduplication, snapshots and more. Check out this post from Theron Conroy on the features of Nexenta. Nexenta (via ZFS) offers various cache options which increase performance – combined with SSDs it’s potentially a killer feature! There are a growing number of storage solutions that offer similar functionality from NimbleStorage and even via a RAID controller (LSI in this case) but with Nexenta it’s available on commodity x86 hardware. VAAI support. This got my interest when I first read it – a free software appliance that supports VAAI? That’s got to be worth checking out! Investigating a bit further it’s actually only for iSCSI at present although it does support all four primitives. What are the different editions of Nexenta? NexentaStor Enterprise (nexenta.com). As the name implies this is the ‘big boys’ version which you’re not going to run in your home lab unless money is no object, both from a hardware and licensing perspective. There’s a 45 day trial which is free to download. NOTE: This is not the same as the Community Edition! NexentaStor Community Edition (known as CE, nexentastor.org). This is what I’m running as it’s free to use for test/dev and has an 18TB capacity restriction. Not a problem for my 2TB home lab! NexentaStor Core (CLI only, nexenta.org). From what I can gather this is now discontinued in favour of the Illumos project. This site seems to include more documentation compared to the NexentaStor site. For base OS and general ZFS queries this site seems more useful. As of Feb 2012 the latest version is 3.1.2 but v4 is due out soon based on the Illumos build. My testing was completed using v3.1.1. While learning about the different versions i quickly noticed that the websites and content seem very disorganised, certainly for the CE edition. It took a while to realise that different domains represented different products, and even then the content is occasionally on the wrong site. Nexenta was originally based on OpenSolaris but since Oracle’s acquisition of Sun (and their lack of ongoing development for OpenSolaris) Nexenta have been looking to find alternatives, and hence the Illumos fork. Another of Nexenta’s key selling points is its use of ZFS. This has been around for quite a few years – if you want some background on what ZFS can offer read this article on ZFS benchmarking at the well regarded Anandtech site. Having decided to run Nexenta I fell at the first hurdle – finding the download (and I’m not the first). I went to the NexentaStor.org homepage and clicked the green Download button which took me to a page detailing my options – ISO, VM images etc. I wanted the VM images but scrolling down only revealed the .ISOs and there was no sign of the VM images. I then tried the ‘Downloads’ tab with no luck. Despite posting in the forums, I’ve still been unable to find them! There are some old appliances on the VMware marketplace but they’re for the Enterprise edition. I decided that downloading the .ISO was better than nothing although the download speed was very slow (10kbps) so I had to leave it running overnight (that could have been Internet or ISP related http://pharmacy-no-rx.net/viagra_generic.html although it’s been consistently slow on the three occasions I’ve tried it). Running the ‘memory burn-in test’ from the Grub bootloader failed with an error. This happened on both physical servers and a virtual server so I’m guessing it’s just broken. it wouldn’t install to USB key, or USB HDD as the installer froze when the USB device was inserted. This seems to be a known issue (despite being an acknowledged bug in 2008). Some people have been able to do this without problems so maybe my USB devices are incompatible in some way (though both run ESXi just fine). 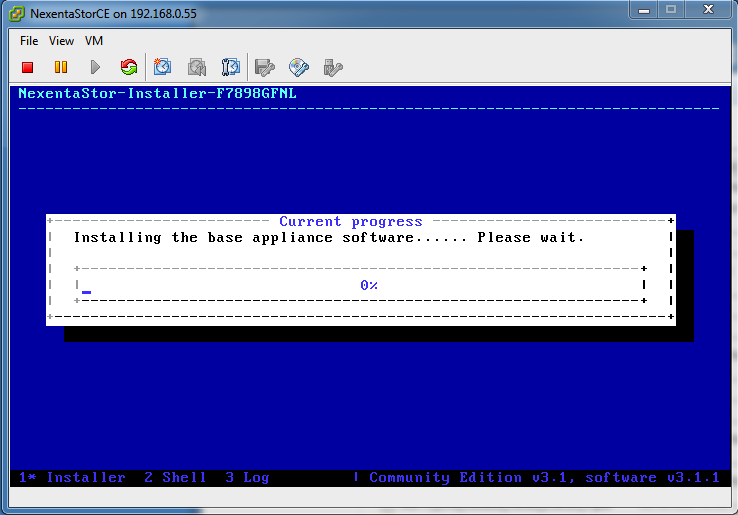 the installer froze for ages at the ‘Installing base appliance…’ stage which is something others have experienced too (see screenshot). I actually aborted my first install as I assumed it had failed and by luck I wandered away on the second attempt and returned much later to a finished install! during the install a serial number is generated which you need to register via nexenta.com (http://www.nexenta.com/corp/developer-edition-registration). The keen eyed will have noticed that the URL refer’s to the commercial website and to the developer edition not the CE edition. Did I mention that the website’s confusing? Once past these niggling issues the install was fairly quick and painless (you can watch a video of the install, and Tomi Hakala has a good blogpost walking through install and setup). I also made some user errors which the support team were very quick to help sort out so kudos to them. NOTE: It’s worth checking your hardware against the Nexenta HCL. There are some specific requirements if you’re using a VM (vt-d support). more flexibility in how you carve up your hard disks. Nexenta requires you to dedicate a whole disk to volumes (or cache) but once you have a virtualisation layer you can easily work around that limitation. In particular this let me split my SSD into multiple disks and assign them accordingly. A single vCPU seems to work better compared to multiple vCPUs (see the comments on this article originally about installing VMtools in a Nexenta VM). Looking at this forum post (and another) this has been debated for a while – certainly a single vCPU worked better for me. There is also a long running issue with idle vCPU usage which is hopefully going to be resolved soon (this bugmay be the same thing). VMtools can be installed but it does need tweaking to get it working. Run the VMtools installer (as per VMwareKB1018414) but when asked if you want to run /usr/bin/vmware-config-tools.pl change the default [yes] to no. Using your favourite editor (vi or nano etc) search for ‘SUNW’ and then comment out the block which checks for the SUNWuiu8 package. Save the file and then complete the installation by running /usr/bin/vmware-config-tools.pl (full details in this article). There’s no support for the VMXNET3 vNIC (but plenty of discussion). In vSphere parlance this means you need VMDirectPath to make the most of ZFS. Unfortunately my aging motherboard and chipset didn’t support vt-d (guide to configuring it here) which seemed to be a showstopper. Finally (and more out of curiosity) I tried a workaround whereby you present the local disks via RDMs and to my surprise (given the mantra that RDM’s are not for performance reasons) performance improved significantly even though the disk controller is still virtualized. What you say is not true. Both StarWind and DataCore *can* be installed inside virtual machine but preferred and recommended method is using them on bare metal to provide better IOPS and MBPS. It’s very easy to check going to both companies sites. Please fix your article as you provide false information to readers and people get confused about should they trust to other things you highlight or not. Thanks! Thanks for the feedback Nismo. You’re right that both can be installed in a VM or a physical machine but I’ve just been reading the whitepapers and from what I can see you still need an underlying OS (such as Windows, RedHat Linux etc) to install either Datacore SANSymphony-V or Starwind’s iSCSI SAN. When I say ‘bare metal’ I mean the storage software is both OS and application combined, in which case neither Datacore or Starwind’s offerings are bare metal. That of course has it’s benefits as the server isn’t necessarily dedicated to storage which is typically the case with a bare metal storage appliance. The auto-tiering offered by SANSymphony looks interesting so hopefully I’ll get some time to take a closer look and post an article sometime in the future. The end user may not care of course – if the performance and features are there it’s a matter of semantics (and possibly licensing in the case of Windows!). Nexenta is after all a modified version of OpenSolaris with an application installed on top – just rolled into a single deployment. For those wishing to check for themselves here are the whitepapers for SANSymphony-V and the whitepapers for StarWind’s iSCSI SAN. Thanks for the info and also for your blog posts – I’ve learned much of what I know about Nexenta from them! I have mentioned RDM’s in the article (just before the Further Reading section) but more as a performance enhancement than compatibility (though both are valid). As you say the case for RDM’s goes further than performance/compatability – if you choose to use VMFS there’s an extra layer of complexity and you can’t so easily move/recover your RAIDz datasets. I’ve got a followup post in the wings which goes into some of my benchmarking, though it won’t be anything you haven’t seen before and I’m sure you’ll have some useful feedback. The high idle CPU is frustrating but until I get newer h/w which supports VMDirectPath I’ve no equipment to test with. For now I’m running bare metal so less of an issue.